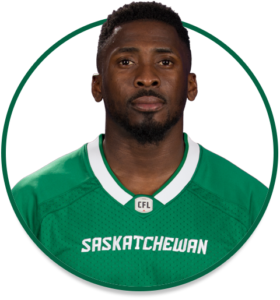 PRO: Acquired by the Riders in May, 2017…signed with the B.C. Lions as a free agent in February, 2016….acquired by the Hamilton Tiger-Cats in October, 2015…selected by the Montreal Alouettes in the 1st round (3rd overall) of the 2013 CFL Draft. 2018: Started 18 regular-season games and the Western Semi-Final…had a career-high 61 defensive tackles…added 10 special-teams tackles, two tackles for loss, two interceptions and one fumble return…added two defensive tackles and one quarterback sack in the playoffs. COLLEGE: Played two seasons at the University of Calgary (2011-12)…played 16 collegiate games with the Dinos…registered 91 defensive tackles, 12.5 tackles for loss, five quarterback sacks and two interceptions…spent the 2009 season at McGill.